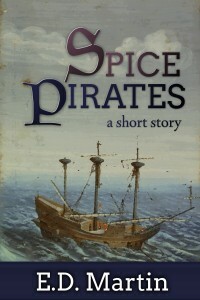 For July and August, I’m pulling from “Spice Pirates,” my long short story that I’d planned to have live on Amazon last week but it was a really busy week (I taught a high school enrichment class, plus with the water line to my house still not fixed and no AC with heat indexes 100+ degrees I spent more time trying not to be here) so my plan now is to have it uploaded to Amazon today and live by Monday, in which case I’ll update this post. “You’re a pirate,” she whispered, a gleam in her eyes and a big grin on her face. “I’m—” He stopped. He wasn’t, of course, but he wasn’t a fool either, and if this girl respected pirates, if he could use her awe as a way to get something to eat, then he could be a pirate. “It’s not something you walk around bragging about.” There; he hadn’t confirmed it, but he hadn’t denied it either. I agree that being a pirate isn’t something to brag about – not with being perennial thieves and all. I hope Rosamaria won’t regret meeting her new friend. Lying will get you in trouble. But also makes for an interesting story! Does this mean he’s going to have to live up to pirate’s reputation? And can he do it?